The market falls and trades below the last trading session. The bears cheer, and the bulls lament. In the next few seconds, the market rises before their unbelieving eyes to close above the last trading session. Now, the bears are confused, and the bulls are cocksure. What just happened will show up in a daily price chart as an outside bar (outside day). An outside bar is emotional and erratic. It tests the extremes of polar market sentiments, prompting intense emotions from short-term traders. But, if you stay calm before the market tips its hand, you can exploit the chaos for profit. You will see bullish traders buying blindly above a bullish outside bar. There will also be bearish traders selling below a bearish outside bar without thinking. These are the traders we aim to trap with this swing trading setup. This strategy uses a 20-period simple moving average (SMA) as a trend filter. The market breaks below the low of a bearish outside bar. Place a buy stop order above any bullish bar. 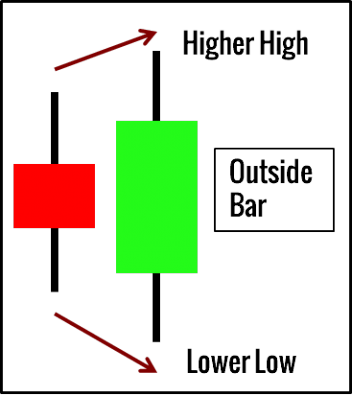 No bar high should be lower than the low of the bearish outside bar. If that happens, the setup is invalid. The market breaks above the high of a bullish outside bar. Place a sell stop order below any bearish bar. No bar low should be above the high of the bullish outside bar. If that happens, the setup is invalid. The chart above shows the daily price bars of Sealed Air Corp (SEE). The color of the SMA shows its direction. The market sustained a bullish drift for over a week. This bearish outside bar formed at the end of a protracted upthrust. It drew in counter-trend traders who were betting on an overextended bull trend. However, they did not enjoy any follow-through. 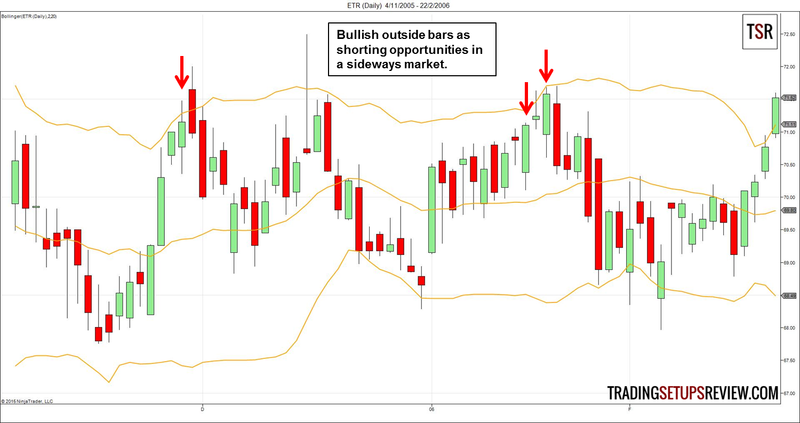 The bearish outside bar failed immediately with a bullish pin bar. Hence, this bullish pin bar offered an excellent failure trade. The blue lines marked out a possible target projected with the recent bullish thrust. Learn other ways to take profit for your swing trades. This is the daily price chart of Entergy Corporation (ETR). The bearish gap below the SMA confirmed our bearish market bias. This bullish outside bar caught our interest as a potential failure trade setup. However, its exceptional wide range did not bode well for the young bear trend. The breakout above the outside bar met instant resistance. 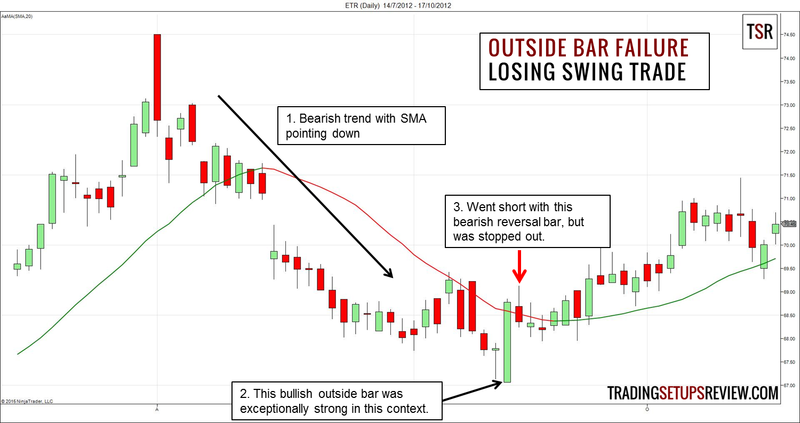 The resulting bearish reversal bar led us into a losing short trade. The best Outside Bar Failure setups fulfill the characteristics below. The range of the outside bar is small within the context of the trend. Take a close look at the examples above. 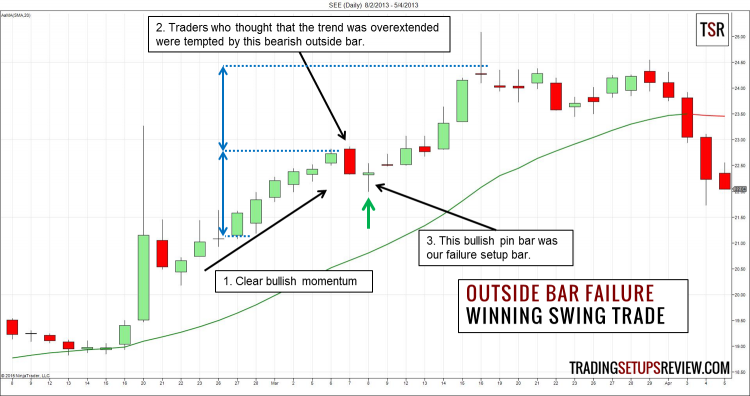 The outside bar in the winning example barely reversed the bullish thrust before it. Whereas, in the losing example, the outside bar almost rose above a two-week congestion. Both outside bars looked strong in isolation. Yet, the price action context showed us which one was more likely to fail. In this strategy review, I looked for Outside Bar Failures in a trending market. In fact, this pattern is versatile, and you can trade it in a ranging market as well. Outside bars that trap breakout traders offer great breakout failure trades. For this setup, the opposite extreme of the outside bar is a safe target. For a more ambitious target, aim for the last trend extreme or a S/R level beyond. Don’t get trapped by the market again. Instead, learn to profit from other traders’ failure using price action. Which Bar high u meant to interpret here? ?